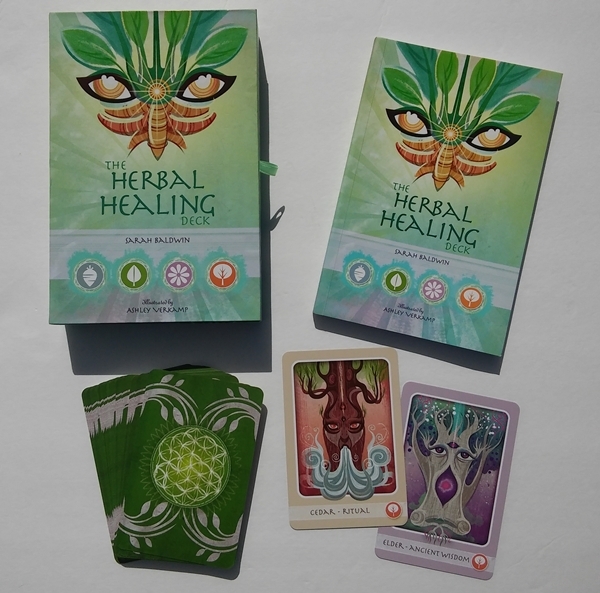 The Herbal Healing Deck (written by Sarah Baldwin and illustrated by Ashley Verkamp) is a lovely oracle deck and book set that I connected with immediately. The readings I've done with it have been almost eerie (in the best possible way) in their pinpointed exactitude. The deck and book are housed in a sturdy box that closed magnetically. The deck sits in a recessed cardboard home within the box. There are 48 cards, each measuring 3.5" x 5 1/4". They are big cards, but they are very flexible, so they are easier to shuffle than you might expect. The cards are glossy and feature reversible backs though the cards are not designed to be read with reversals. The borders are varying solid pastel colors, though not indicative of their "suits". The cards are separated into four groups (12 cards in each group): Roots, Herbs, Flowers and Trees, each corresponding to a different season and direction. The groups also differ from one another in how they correlate with the human experience. For example, Roots symbolize the subconscious, Flowers represent individuality, etc. I appreciate these extra layers to the cards. The images are so delightful. Many of them have eyes, which give them personalities. I did find the eye distribution throughout the cards odd. All the Tree and Root cards have eyes. All but one of the Leaf cards have eyes. But none of the Flower cards have eyes, save one. I would have loved to see eyes in all the cards, as it is one of the things I love about the images. TREE: Hawthorn. The card is about heart healing, and I love the heart in the trunk, the whimsy of the angles of the tree and the colors in this card. LEAF: I will cheat and pick two. I love Mugwort because I am very drawn to the purple colors, and the dreamy moon in the center is beautiful and wonderfully illustrates the theme of the card (cycles). But I also really love the crystals incorporated in the Horsetail (Higher Self) card. FLOWER: I surprised myself here by choosing Calendula. It's a very vibrant yellow card, and not my usual style. But it really sings to me and gives me a good vibe. ROOT: I really like the Black Cohosh card, both because it's black and adorable, and also because I had a personal reading with this card that blew my socks off (explained later in this review). The cards have mostly positive keywords, but there are some beautiful shadow cards. I like that the deck doesn't shy away from the darkness. (This Scorpio only feels at home with a bit of darkness in everything.) In addition to the Black Cohosh (Darkness) card, there are others like Poison Ivy (Caution) and Red Root (Shadow Side). During the week that I used this deck for my daily draws, the cards were incredibly relevant to my inquiries. At that time, I was dealing with separating my life from my mother. My very first draw with this deck was the Walnut (Tree), which talks about the need for letting go of family influences, and family members, if necessary, which was my situation exactly. The very next day I drew Black Cohosh which deals with feminine darkness, particularly in the mother line. I was blown away. And then there was the synchronicity. The Black Cohosh card also talks about the healing energy of unicorns, and after I drew that card, I noticed 4-5 more unicorn sightings that day! With every reading, there was always something in the book's passage that dealt very intimately with what I was going through. It was Winter when I first received this deck, and that week out of eight daily cards, I drew 5 Winter (Root) cards! Taking this a step further, the Root cards symbolize the subconscious, so that would indicate that there was a lot of undercover gunk going on for me that week. That was certainly true. At first glance, the deck looks lighthearted and whimsical, and you might expect your readings to reflect that, but I was pleasantly surprised to find that I got such deep and meaningful insights from it. The book is an invaluable resource for working with this deck. The book is 144 pages. It begins with a Table of Contents which conveniently separates the cards into the four groups for quick reference. The "About the Deck" section includes commentary on plants, our connection with them and their medicinal benefits. The deck was designed to facilitate communication between humans and plants. It focuses not so much on herbal medicine, but rather on messages from the spirits of the plants used for herbal healing. I enjoyed reading an excerpt which stated that in plant spirit medicine, you don't need the actual plant's physical presence, application or ingestion in order to have an effective healing. This was something I recently appreciated reading in Tess Whitehurst's The Magic of Trees. It was lovely to hear it again confirmed in this book. In the section titled "Dancing with the Plant Spirits", the author and artist each share a personal story on connecting with a plant and how they intuited the information for the deck. Next is the section "How to Use this Deck". This includes information on working with plant messages, within and without the deck. There are some divination basics here as well as tips on reading with only one suit for specific inquiries. There is a blurb on using the suit's four seasons as timing. Also in this section are ideas on how to use the cards for uses other than divination. Each of the four groups begins with an intro to the suit. I loved reading these, because they provide a deeper background into each of the suits, and give you extra layers with which to read the cards. On the top of each left-side page is the image of a card, which has a fading color behind it. Each of the four groups has a different color, so when the book is closed, you can see the four different colors along the edge of the pages, so you can easily jump to the different sections. It's a very attractive book. There are full color images of the cards, though smaller than the cards themselves. Each passage begins with some background information on the plant, sometimes (frustratingly not always) telling you where the plant can be found in the world, sometimes including folklore attached the the plant, sometimes including a corresponding chakra, etc. Then a little bit about how the plant is used as medicine. The bulk of the passage is the message from the plant. These messages are rich and deep and well intuited. As I said, the cards I drew for myself touched exactly on what I was going through at the time, which was insanely specific. The messages include sage advice you can apply to your situation in a practical way. It is a wonderful resource for spiritual healing. The book ends with a 2-page bibliography. I was so delighted by my experiences with this deck and continue to use it regularly. It is deeper than it looks and can be used for any inquiry. Definitely a keeper! Deck: The Herbal Healing Deck by Sarah Baldwin and Ashley Verkamp, published by Schiffer.